Chiller System Design Assistance | Legacy Chiller Systems, Inc.
Getting chiller system design assistance is easy with Legacy. Choose from three chiller design support options and you will be on your way to success! Since process chiller systems are our primary line of business, Legacy has staff engineers available 24/7 to assist you. If you are just looking to get some basic ideas on what you need or simply need to confirm sizing and options we can help. Call 877-988-5464 x 101. If you have a large scale project that requires detailed process design drawings, PE stamps or other specialized plans and specifications Legacy offers fee based consulting services. For more information call 877-988-5464 x 101. If you have a rough idea on your process chiller requirements, download our SystemSyzer chiller system design software. By inputting some basic information about your process chiller needs, SystemSyzer will automatically calculate chiller capacity, pumping requirements and pipe sizing. SystemSyzer has become the standard basic design tool with the HVACR industry. 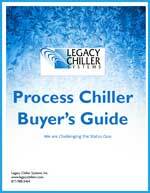 Complete the form to the right to download our Process Chiller Buyer’s Guide.